Toronto’s historical monuments are a legacy of our people. It reminds us of our roots and heritage. And, Pour Concrete does the work of preserving the legacy beautifully. The GTA-based full-service contractor has successfully completed several renovations in and around GTA. A strong exterior guarantees a beautiful interior. Sadly, moisture, pollution, exposure to weather and time can cause damage to the structural integrity of a building. Pour Concrete will protect your building against moisture damage, water penetration, oxidation and general wear and tear that can make the structure weak. Pour Concrete not only undertakes exterior restoration of Toronto’s historical building but it also repairs flooring and plaster inside the building. The contractor ensures efficient plumbing repairs as well. Why choose Pour Concrete for Restoration of Historical Building in Toronto? Our expert restoration team will visit the historical building and discuss the ideas and goals that you have for the building. They will assess the structural integrity of building and recommend appropriate solutions for restoring the property. Pour Concrete is the best historical restoration contractor that you can rely on for taking care of your heritage. Get in touch with us for a simple roof repair or complete restoration of a historical building in Toronto. We will ensure a fair budget and excellent workmanship. Call on 647-368-6206 or obtain a free estimate. My experience with Pour Concrete was phenomenal. I was in touch with few others for waterproofing but I was most happy with Pour Concrete’s estimate. I felt comfortable because its representative explained me the exact procedure of waterproofing my home. Work was finished on time. 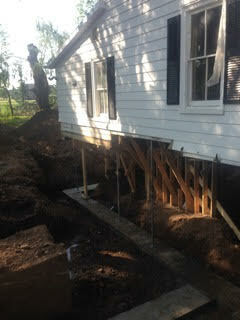 Pour Concrete’s team was punctual and professional in undertaking the underpinning work at my home. My husband and I were unsure of safety and security of the foundation. But, the team did a great job with my cramped basement. Now, I can actually use my basement efficiently. I called Pour Concrete for fixing our bathroom. It was not draining properly and there was a constant issue of water backup. You came right over and repaired the drainage pipe. I was happy to learn the cause of drain clogging. I recommend Pour Concrete for emergency drain repairs. I was shocked to see large cracks in the foundation of my property. I needed a quick and long-lasting solution for the problem because I wanted to rent out the property. Pour Concrete did a great job of taking care of the cracks and solved the flooding problem in the basement as well.